How The Grinch Found Yoga. Every yogi in Yogaville liked yoga a lot…. But the Grinch, who lived just north of Yogaville, did not! The Grinch hated yoga! The whole yoga culture! It could be his mind was closed a little too tight. It could be, perhaps, that his breath was too slight. He kept his heart protected, not allowing it to be free. Whatever the reason, his heart or his mind. He stood there that evening, not feeling very kind. At the warm yoga bodies moving with such ease. While looking their best in their fancy yoga clothes. Their photos, their quotes, their Instagram postings! The kale and kombucha, the juice cleanse hostings! And soon, oh so soon, they would be yoga singing! The sound of their OMs! Well, it would have his ears ringing! This “unyogic” Grinch got a crazy idea! The Grinch held his breath, not knowing what was in store. He stepped onto a mat, with out expectation. The evolution was slow, but he found meditation. And there on the mat, released of all drama. 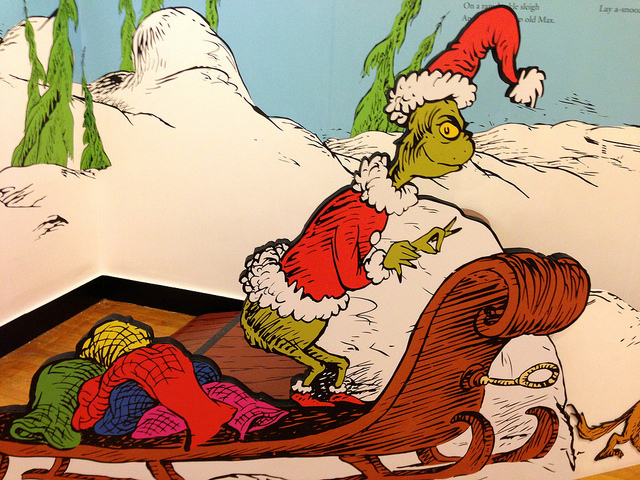 The Grinch discovered more than only one of the yamas. It just takes some presence, a trust in the self. In mindful action, the Grinch found some wealth. And he sat down a few moments, till his breath became longer. His mind became quiet, his inner voice grew stronger. That the Grinch’s trapped heart broke open that day! His mind opened up too and he found yoga bliss. And he stepped on his mat. Both feet firmly at home! And he, he himself! The Grinch sang the last OM! > If Dr. Seuss had Been a Yogi. > 10 Reasons I Hate Christmas. Love, The Grinch. Fantastic!! It’s very clever and so on point. Thank you for adding a warm smile to my evening. Namaste. 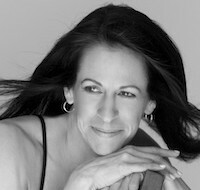 Lyn Gerfin Kehoe is the founder and director of Buddhi Mat Power Yoga Studio in Ridgefield, CT. Studying and teaching power yoga for almost two decades. Grateful to her teachers, Baron Baptiste and Bryan Kest, for showing her what power yoga really is. And encouraging her to trust , listen to and be guided by her own silent voice of wisdom. She takes the plunge into the blogging arena, hoping to spread the word of what true power yoga is and dispel all misconceptions. You can find her on Facebook, or follow her onInstagram and Twitter.